Our Second Great War alternative history story arc adds ships and planes to Second World War at Sea games to re-create a naval war that never happened, featuring ships and even nations that did not exist, either. Mostly we’ve done so through books, and one complete game (Tropic of Capricorn), but for the heart of the naval war, the struggle for the North Atlantic, I felt that we needed more new pieces than we could stuff into a book. 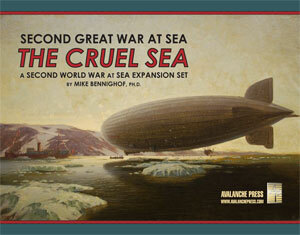 The Cruel Sea, therefore, is a massive expansion set for Second Great War at Sea: four sheets of new pieces, totaling 660 pieces: 320 double-sized ship pieces and 340 normal-sized square ones for aircraft, small ships and markers. The bulk of those represent Imperial Germany’s High Seas Fleet, with the remainder roughly evenly split between French and Russian forces. The Cruel Sea isn’t a complete game; it draws on Bismarck and Arctic Convoy for its maps but not any pieces. The focus is on the opening seven months of the Second Great War, as the Germans attempt to protect their sea lanes leading to the United States while the Russians and French try to disrupt them. Meanwhile, they also want to interrupt communications between their two enemies; possession of Iceland (leased from Denmark) and Svalbard (claimed after the First Great War) gives the Germans bases astride these routes. At the same time, supplying those bases means crossing a wide stretch of vulnerable, cold water. For the alternative-history scenarios in the Second Great War story arc, I like to present a different strategic/operational situation than that of the base game; it shouldn’t just be more or less the same game with different-colored pieces. Different parts of the map should come into play in different ways, and the strategic challenges should be different. While many gamers are going to pick up the set just because it has many new ships in it, those who focus on the game play first should feel rewarded with a new situation in seemingly familiar waters. And that’s what they’ll get in The Cruel Sea, often having to face multiple challenges simultaneously – protecting their own vulnerable merchants or transports while trying to strike those of the enemy. While the oceans are vast, giving French and Russian raiders a lot of open North Atlantic water in which to hide, the closer seas are very narrow. There are only so many routes from Wilhelmshaven to Reykjavik, and Scapa Flow sits on top of all of them. The Germans will need to run across many convoys before the British intervene and imperil this traffic. I also crafted the alternative history background to favor battleships as the weapons platform of choice, with aircraft development well behind that of our own reality and airships and helicopters very prominent (which also suppresses the effectiveness of submarines). Battleships are very hard to sink through gunfire, but vulnerable to air attack; in the actual war, those factors resulted in very few surface actions between opposing battleships. In sharp contrast, the Second Great War at Sea is a battleship war: all of the fleets are built around battleships, which are regulated in maximum size and gun caliber by naval limitations treaties similar to those signed in Washington in our own history but with significant differences, chiefly allowing many more of them to exist than was the case for the actual treaty, and encouraging the retention of older hulls. Most of the ships in The Cruel Sea are German, and they include 31 battleships and 15 battle cruisers. Of those 46 heavy ships, 13 either served with the original High Seas Fleet or were laid down during the course of the Great War. The Russians have just nine battleships and battle cruisers (only their Arctic Fleet is present in this set) and the French receive 26 of them (plus two more in the Bismarck game), including both re-built old ships and new fast battleships proposed but never built. For all of those ships, I wanted the proposed designs to have a firm grounding in reality rather than simply making stuff up out of whole cloth. The French were pretty easy in this regard; the receive ships actually proposed by the Republic’s navy but never built, and re-constructions of older ships along the same lines actually discussed but not completed. German battleship design practice under the Nazi regime remained very conservative, as we’ve discussed elsewhere in Daily Content, with a straight line of design practice connection the König class to Bismarck. Had Imperial Germany survived the Great War, its naval architects likely would have been even more conservative in their approach. These Imperial battleships are similar to those actually built, emphasizing protection over firepower but avoiding the politically-inspired wavering over the caliber of their main armament – they carry the maximum allowed, and even cheat a little on that score. Likewise, the Russian designs follow the Soviet practice of looking to Italy for expertise and inspiration. The new battleships are very similar to the Red Navy’s Ansaldo-designed Projekt UP-41, a ship heavily influenced by the Italian Littorio class. They also have a class of helicopter carriers; I based the drawing on the modern-day French Mistral class since these ships were denied to the Russians thanks to the seizure of Crimea. As designed, The Cruel Sea adds ships and scenarios to Bismarck and Arctic Convoy, letting you play on these maps. I also wanted it to be a base set for other Second Great War expansions; that will allow us to put more new stuff in those and keep expanding the universe of toys. The obvious next step will be a set we’re calling The King’s Ships, which brings Britain’s Royal Navy into the Second Great War setting with additional battleships (because everyone needs more battleships) and also the weapons system in which the British hold a decided technological edge, the aircraft carrier. The Cruel Sea will also provide a lot of pieces for the Baltic expansion book, and even for those set in the Mediterranean and Black Seas (French and Russian aircraft). It’s been a great deal of fun pulling all of this together – you don’t get to create a whole world every day. I think you’ll like this one.